Shuttle service is roundtrip pick up and drop off from your hotel. 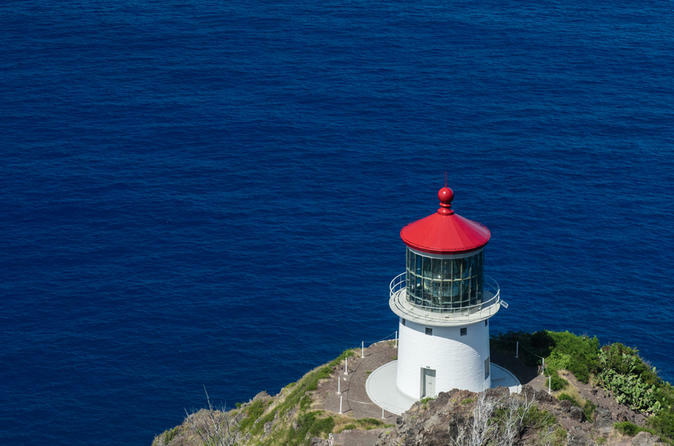 At the end of the Makapu‘u trail, you're rewarded with magnificent views of the windward coast and offshore islets, as well as the historic red-roofed Makapu‘u Lighthouse built in 1909 - which makes a stunning picture against the deep blue sea below. After the hike, the driver will also take you to the Halona Blowhole for a 15 min stop in case you and your family want to take some nice pictures! Get a shuttle from Waikiki at 7 AM and hike the beautiful Makapuu Lighthouse Trail. During this easy hike, enjoy magnificent views of the windward coast, on a clear day you may even see the Moloka‘i and Lana‘i islands. Don’t forget to take pictures of the historic Lighthouse! From November until April, keep your eye out for the humpback whales, this is one of the best whale watch places on Oahu. This tour also includes a bottle of water and there is NO additional fees. After the hike we will take you to a 15 min stop at beautiful Halona Blowhole, watch the waves crash into the rocks and spray water up to 20 feet in the air!